Most of us who have delved into style systems deep enough to end up getting into a system from thirty years ago like Kibbe has undoubtedly come across many different style systems. One of the most popular today seems to be Dressing Your Truth, which is a Four Types-based system. Before I start talking about, I have to say two things. One, I haven’t bought the course and have only read Carol Tuttle’s books and watched her YouTube videos. So I don’t know the exact recommendations you get once you shell out the $99-$297 for the course, but I feel like I get the general idea. Two, I think it’s important to understand some criticism of DYT, which include not giving sources and some customer service issues. I still find DYT helpful, though, because the materials are much more accessible than the older Four Type systems, and I think it’s good for understanding your inner yin/yang balance and how it can potentially influence your style. With that out of the way, one of the issues that many people come across is that things don’t always match up. Once you’ve typed yourself in all of these systems, your various types may not be all that compatible. For instance, I’m a Light Spring in 12-color systems, a likely Soft Natural, and a Type 3 in Dressing Your Truth. Light Spring and Soft Natural work pretty well together, but Type 3 in Dressing Your Truth wears shaded colors, colors that have had black added. This is basically as incompatible with Light Spring as you can get, which is as light as you can get and would be compatible with Type 1 energy. So as a 3/4 with 1 being a strong tertiary, I figured I’d end up in on the far left portion of Soft Dramatic. I hope this makes sense. But of course, I’m pretty sure now I’m an SN, which is in the opposite quadrant. The other issue with this chart is that, despite the fact that Carol presents the Energies this way visually, the movement levels of the types next to each other on the X-axis are not equal. The movements go 1, 3, 2, 4, from highest to lowest. 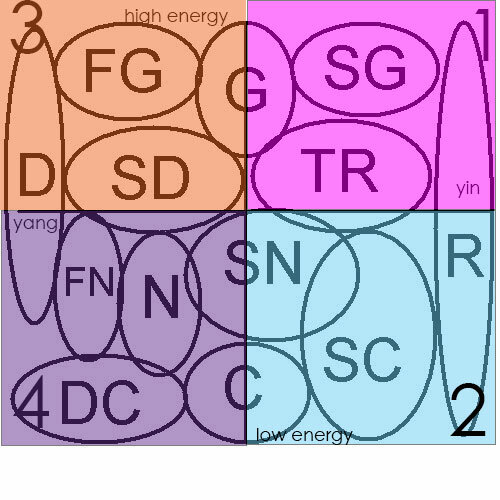 So I guess you could say Type 1 is Yin Highest Movement, or SG; Type 3 is Yang High Movement, or D/SD; Type 2 is Yin Low Movement, or SN/SC; and Type 4 is Yang Lowest Movemnent, or DC. These kind of seem to work, if you look at the recommendations for the types, but there are, of course, four other Kibbe Image Identities to consider that then wouldn’t be included in Dressing Your Truth at all. More importantly, when I posted this image on Seasonal Color, it was pointed out to me that Kibbe is mainly focused on the lines of the body, and Dressing Your Truth on your inner expression. A Dressing Your Truth purist would insist that your inner energy movement would trump all. So I, as a Type 3 Light Spring Soft Natural (if I am in fact a Soft Natural, which I’m not sure of yet), should forget about the light-yet-bright colors of Light Spring and the softer lines of Soft Natural, and just dress with the sharp lines and heavy autumnal colors of Type 3, since that’s what my inner energy requires. I am not, of course, a Dressing Your Truth purist, if you couldn’t tell from the fact that none of my blog posts have focused on DYT thus far. But I do think it’s important to understand how your inner self can affect your Image Identity. Kibbe does, after all, dress people within the same type differently. People fall in different places on the continuum. You may find that if you have a yang DYT type and you’re a yin Kibbe, you may want to look for inspiration in accessories or prints in the yang version of your type. If you’re a Type 4 and a Light Summer, try using the purest colors your palette has. If you’re a Type 1 Soft Classic, look for things that are a little more “fun” than the usual Soft Classic might wear. And so on. This is only one way of looking at this issue of conflicting seasons and types and identities, but I think it could be a useful tool for those of us feeling overwhelmed by all of this information. Have you experienced a mismatch between your various types? Hmmm. I dabbeld a bit in this DYT-thing. I saw everything that’s free, but not more. In my opinion, one of the big problems is connecting the inside and the outside. So to say when MBTI collides with Kibbe. Ok, so someone is Type1 because of high bubbly energy levels, but Kibbe Soft Classic. Or a Type4 Romantic. Or whatever. The outcome can’t be satisfying. In my opinion: find out who you are inside, find out who you are outside and then figure out how to combine them. But what really really bothers me is the connection between the inside and the outside. I really have a big ideological problem with it. In my head using such links is not far away from racism, lookism, etc. Apart from that, DYT doesn’t match my own experiences. I’m a DYT Type2. It could match, because I’m an INFJ and I’m pretty sure that I’m a Theatrical Romantic. But I’m a True Winter, and from this palette my best are intense and rather bright colors. I guess the Type2 kind of TW colors would be neutrals like navy and charcoal and the light, icy colors (the Winter version of pastels). These are wrong on me. Too classic, too soft (which seems wrong as TW really isn’t soft at all). It seem’s to resonate with TR, but not with Type2. I would NEVER wear things recommended for Type 2. Never. Ever. I know I would look silly in them. And what should I do with the yang influence in my Romantic type? Like my color type, it should make me a Type2/secondary4. I’m not like that. I’m a secondary1, I’m playful and I like people and I’m not shy. No, DYT just doesn’t work with me. I think it can be a helpful system for a) people who are desperately clueless or b) fit into the system. Oh and somehow I have this feeling that the DYT types somehow are ESFP (Type1), ISFJ (Type2), ESTJ (Type3) and INTJ (Type4). Huh? Sorry, my thoughts are all over the place today. DYT is not only about how people are, but how they look like, too. Type 2 has S curves, Type 1 stars and circles and so on – it’s about lines, too. It would be ok for me, of it really was about insides only, like you explain it, but the combination bothers me. I don’t know what videos there are on youtube, I saw the free introductory video course, two years ago or so. http://youtube.com/CarolTuttleVideos – Carol’s youtube channel. She has lots of videos on very specific DYT topics. I’m an INTJ and not a Type 4, although I do think it’s my secondary and it does resonate with me. In terms of lines and the outside and the inside, as far as physical characteristics, Carol only talks about facial features, hands, and skin texture. Your facial features are the most revealing. I don’t recall her ever talking that much about body lines. Carol’s thing is that your internal movement/energy comes out in your facial features and then should be reflected in your clothes, and I suppose things like whether or not you need waist emphasis or whatever is determined by your particular body. I also would never go on full on “Dressing My Truth.” I don’t like the Type 3 look. They have a video on how different types decorate their house, and I even hate that. I wouldn’t ever go any deeper into DYT and incorporating it into my life than what I wrote in my post. I’m also not that into connections between outside and inside, and don’t like systems like Zyla for this reason. Zyla was totally useless to me, too. If my “internal energy comes out of my facial features”, then it is indeed connecting inside and outside in a manner that reminds me of the pictures the police used to work with, where you can see by one’s earlobes and eyebrows if they are criminals or not. Or those awful Nazi pictues showing “Jews” and “Romani”. Nobody really thinks like that anymore (I hope! ), but determining one’s personality by looking at certain features is something too many people do without thinking about the big picture and where it comes from and how this can easily still be connected to lookism and racism, although people like Carol Tuttle surely won’t have that in mind. When thinking in feminist and anti-consumerist terms, Kibbe and similar systems could be criticised quite similarly. I guess, we should make an effort to stay critical and learn to use such systems for our benefits. Kibbe makes me aware about how I seem or could seem on the outside and I know that to feel whole, I need to find a way to connect my inside and my outside, no matter how far they are apart. No one’s an island and no one can tell me that the outside doesn’t even matter a bit. Maybe DYT is about that too, in the end, we’ll never know, I guess. The connection you made between Kibbe and DYT is very interesting, though. I’m a Type2/1 which seems to be connected to TR. But what to do with the TW? I guess, the intense color pops (fuchsia!) in my style would be the Type1 saying hello. Would be the calmer canvas/background I like for these color pops like black, navy, charcoal be the Type2 basis? Is this how I naturally adapt my cliché Type4 color type? Maybe this DYT thing, connected to color type and Kibbe isn’t so bad at all. Or is it that Mrs. Tuttle “borrowed” quite a damn lot of all that other systems that the connection is just natural when you come to think about it? Hmm yeah I hadn’t really considered that re: facial features. But Carol does say that twins are rarely the same type: http://thecarolblog.com/can-you-determine-the-energy-types-of-these-twins/ So I guess you can have people with basically the same facial features and then entirely different types. But it does get confusing. I can actually see TW adapting to T2 quite well, better than the other winters, since TW is winter + summer. It has a lot in common with True Summer, which I see as a very T2 palette. I think you have some pinks that would work. I thought about it more and there’s something that’s a bit off in the graphic. TR is Romantic with a slight sharper edge, with a pinch of Dramatic. So it would be more logical if Theatrical Romantic was Type2/4, no? Type1 is everything about fun, quirky, energetic. TR isn’t. I can’t imagine R being anything near Type1, at least not as the main type. Someone with Type1/4 would be FG, Type3/2 SN and so on. Huh. Looking at the graphic again, it doesn’t seem that off anymore. It’s purpose is to show the graphic that’s already known with the circly design and put the DYT thing over it, to show the principle, but not be accurate. I guess. Yeah, whatever. TR isn’t type2/1 in my eyes. I don’t think 1/4 would be FG; I think it’d be 3/1. It’s a very high movement witha lot of angularity. The only yin is FG is size, which is why it’s not on the yin side of the chart. 4 adds a stillness to one that often looks like Type 3. I would put TR at 1/4 by the chart, and I think that it actually works really well. 2/1 would be Romantic, I think, or maybe SC. I don’t know where I’d put the Naturals, really. I see why people think Type 3, because many FN recommendations work for Type 3. But SN styles look more like Type 2, although I think SNs have a solidness/strength that is in line with Type 3. Maybe SN would be 2/3, then? Dramatic I agree belongs in Type 4 and not 3, though. Okay, I can see what you mean. But then the graphic really is a bit off, because D is not 3, TR isn’t 1 and so on. I’m not sure if the DYT type isn’t rather the same like the Kibbe cliché styles. We have to see further than the obvious and stereotype. You can make any Kibbe type work with any style and any DYT type with any style. It’s the details that count. It doesn’t work exactly, because Kibbe and Carol Tuttle have different understandings of the relationship been yin/yang and movement (contrast). And obviously there’s the question of whether you can really understand the systems as relating to one another in this way. To me, it is really kind of like trying to do the same thing with season/personality/Kibbe. It does work sometimes, but not all the time, but I do think you can take some elements from your DYT and use it to understand how your Kibbe type would work for you. Like using a John Kitchener PSC evaluation to do the same (ex. using the proportion of angelic or youthful or whatever to push you into a certain direction within the parameters of your Kibbe). I can see 1/4 working for TR, though. I do know it’s common for people to see 1 as just gamine, but T1s are also a type that really pile on the jewelry, so a 1/4, who is a bit more serious, determined, and still than the 1/2 or 1/3, I can see being TR. The amount of accessories and how much a type can “take” is a part of movement, I think. Like Gamines, SDs, and TRs are the types that really need “more” in terms of accessories. In terms of D being 3 (it is also in 4 in the graph), I can see it perhaps because Ds have a lot of angularity, which also belongs to 3, although Ds tend to be a bit more minimal than the usual 3. A 3/4 might work, though. I really like your graphic representation. I am not a DYT fan, but it launched me into this whole world, so for that I am grateful. I show on my blog how many places it is “borrowed” from or at least not created by Tuttle in the slightest. In fact, you can take the 4 types back to the 4 Greek humors or temperaments. So we are looking at basic energy. Even the Greeks talked about facial features, such as profile shapes of the humors. The place where DYT is too limited is not the 4 Chroma, but the fact that they shrink style types for the 4 types. Type 1 is essentially Ingenue (or possibly Gamine), Type 2 is Romantic, Type 3 is Natural and Type 4 is Dramatic (or possibly Classic too). Yikes! That is why many T1s are offended and Type 2s are put off, etc. But even that Tuttle didn’t make up in the other Four Type systems, like Jane Segerstrom or IlluminEssence, etc. Tuttle’s handling of twins and children is ridiculous to me, btw. She also wrote the Child Whisperer as if she recreated the wheel here too. Oy. Worse than that, she is just plain a bully of anyone using the terms Type due to her trademark and copyright claims, which is so hypocritical. I’d be interested to know your thoughts on how the chart works with the 4 Types. As an FG, I actually think that Type 3 does a much better job of describing an FG than Type 1 does. Angles, lump of clay noses, asymmetry… Do you think that other versions of Four-Type systems are less reductive in terms of what style you can wear within a particular type? Oh, yes, not shooting down the topic at all. I also use the shorthand, I just choose to say “Four Type Systems.” I have all the books I can find in that category and list in my amazon, except Caygill b/c it’s too expensive. I should say I’m also not a big fan of Kibbe, well not him so much as the proliferation of his stuff. It’s too complicated and people “spin” about it. I like the yang to yin and high energy vs. low energy idea. That’s why I think T1 is more Ingenue, which of course is not in Kibbe, but close to Soft Gamine (as you’ve written about). And I think some Gamines are sort of T1 and more are T4, b/c Gamine is like a short Dramatic, but then they are higher energy. Romantic is T2 and that’s why I thought I was T2 b/c I’m Soft Classic, so I agree that goes there, and some Classics are T2 or T4, or combos. One place I disagree is that I think Natural is T3. T3s are only Dramatic if they are T3/4 (thinking Kentner here). T4s are Dramatic and Dramatic Classic and regular Classic, I don’t know about any of the Naturals, since Kentner says no to Natural for Winters. Kibbe is by far my favorite, and the one whose philosophy is closest to my own. I actually think his system is the simplest and the most elegant. There is a big problem with Kibbe though, which is people not understanding the system. Thinking they’re a sum of parts instead of a whole. Confusing personality and essence. Using Pinterest/Polyvore sets, which generally show only one standard way to interpret the recommendations and don’t always follow them correctly, to figure out how a type dresses instead of his recommendations. But it’s always amazing to me how, say, in the FG group on Facebook, we all look so different, yet the FG recs work for all of us. But I think that people who are interested in Kibbe, if you can’t go see him, need to read his book and what has been collected over the years from people who gone to see him very carefully, because it’s so easy to do the whole thing wrong. When you just look at pins and things instead of listening to what he actually says, that’s when you spin. I don’t use straight Classic/Gamine/Natural, since Kibbe no longer does. Among FGs, I see a lot of 3s and some who are either 4/1 or 1/4. Which makes sense, actually, because sometimes people who type themselves as 1/4 or 4/1 end up being 3s, since the energy mix is similar. The combo of 4 and 1 produces an FG who is more like short DC, and they can wear more classic styles and need less asymmetry. Those who are 3s can’t do that. FG also has potential blunt N yang, and these FGs are always 3s. You see very little influence of 2 among FGs. I didn’t make the original chart, and reading about FN today, I might put it as less blended than it is here and put it in the bottom of the 3rd quadrant. I do think FNs tend to be 3s–Cindy Crawford, for example. I wouldn’t put SN in 3 though; I think SNs are either 2/1 or 2/3–2/1s being the more youthful SNs who are sometimes confused for SGs, like Emma Stone. Instead of saying 1=ingenue, 2=romantic, 3=natural, and 4=dramatic, I think it’s better to keep the definitions as high or low energy yin or yang. FN and SN, for instance, have a different yin/yang balance and SN is much more blended, using watercolor prints, etc. I agree with D 3s being 3/4–I think of Lauren Bacall. I’d say that the other D type would likely be 4/3, as well. In terms of season, I don’t like tying types to coloring. This is why I don’t like the systems that are a direct descendant of Caygill as much. I think you can use the corresponding colors from your own palette without having to be an autumn in Type 3, although I will say I think I’m in an autumn-influenced season. We’ll see when I get draped soon. Thanks for the links about the bullying! That was a bit shocking. But maybe not surprising. Being told how (or should it be ‘what’?) to think & feel in Utah, as it was said, does make sense. What I’ve seen of her videos seemed flattering & a little too cheery, & now I see what’s behind it. Anyway, I don’t fit in Dressing Your Truth at all. My personality type is INTP, so too serious & calm & introverted for Type 1, too much of a thinker & not detail-oriented enough for Type 2, too calm & quiet & laid-back for Type 3, & too laid-back & disorganized for Type 4. I think my style is mainly Natural, also somewhat Classic: Natural body, Natural-Classic face, clothes mostly preppy & very modest, no makeup, minimal jewelry. Natural fibers because I have sensitive skin & get cold easily. Some things that work for me: long twill or corduroy skirt, polo shirt, argyle sweater, riding boots. I don’t think DYT has anything at all like this. Everything is trendy & looks largely synthetic. It’s in a showy shape, showy color, or both. Almost everything is flowy & too delicate, sharp & stiff, or so tight I couldn’t relax or be modest. I watched a whole video promising to get me to wear leggings. Ha-ha-ha-ha… Never. I have light beige skin with slightly warm overtones & cool undertones, dark blue-gray eyes, & moderately dark brown hair more ashy than golden, with the faintest red tint. My best color is navy, worst coral or jewel-tone. So I think my season is a semi-dark, semi-soft, warmish Summer, like Toasted Soft Summer. But DYT colors (I’m an amateur, so guessing! ): Type 1, Bright Spring; Type 2, Soft Winter; Type 3, Warm Autumn; Type 4, Clear Winter. It seems the colors are wrong for most people! Is Carol Tuttle, Type 3, a Warm Autumn (or whichever colors those are)? If so, HOW CONVENIENT, right? I really wonder though what she’d want to pigeonhole me as, & how she’d try to explain away all my analysis. I think the above chart is pretty accurate. As a Kibbe SN, I came out in DYT as a combination of type 2 and type 4 almost equally overall but slightly leaning towards type 2. Oddly for “a Natural first and foremost”, I did not have a dominant type 3 in this system, but this chart made it clear. I also notice on this chart that SN sits up against type 1, and I did have a tertiary type 1. So I think once again, DYT (if this chart is indeed accurate) confirms my SN Kibbe type. I wouldn’t use another system to confirm Kibbe, since all systems work differently. It’s nice when they all correlate, but different stylists can have different visions. Though I know that triangulating between systems to see where one fits best is not advised (as you said directly above), but this still provides food for thought. I am a 2/1 with a tertiary 4. I’ve been thing I’m an R (while still questioning about SN and occasionally SG). Since 2/1 is pure R that kind of lends confirmation, but with that 4 tertiary it definitely looks like SN (and definitely not SG). So although this does not necessarily mean I am SN, it does mean that I’m going to be reexamining Kibbe’s guidelines and trying to see how I might fit. When I took Kibbe’s test I was primarily Ds & Es, but with some Bs. I always wanted a Natural Romantic category (even though I’m not sure I am a natural romantic, and this graphic does kind of pose SN as able to encompass that possibility. Based on the comments and additional thinking, have you thought about changing the graphic to reflect your changing views on which categories overlap where? I was reading along, but I am definitely a visual person. 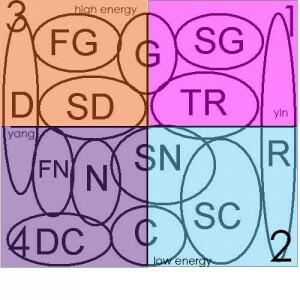 This chart is really old, and I actually think Type 2 lines up with a certain kind of SN. It’s a bit more languid. It definitely wouldn’t work with Kibbe R, though. Way too much downward energy… R focuses the attention up by the face. Any chances of an updated diagram? No, I don’t think Kibbe and DYT mesh together very well. So that means they may overlap with more than one kibbe etc. – though some would be ‘outliers’ that you really wouldn’t see in an incompatible dyt type, so maybe it’s clue if doing both that one or the other is not correct for you — but that’s about it really. But secondaries in dyt make a lot of difference re what people do with the guidelines from what i see in various groups.. And therefore what kibbe most like etc.
. – I guess the general Yin/ Yang ideas perhaps can give sense direction – but most of these systems don’t really map and use the words slightly differently. I’m a Kibbe Romantic and a DYT 3. I’m taking the soft lines and upward focus of Kibbe R and pairing it with the more vibrant colors and patterns of DYT 3. I’m on the fence that I might be a TR, which makes better sense with the DYT 3 colors and patterns and texture. I definitely don’t think there is a code to be broken where they line up neatly. I don’t really think TR (or any Image ID) would suit T3 any better. Kibbe Image IDs are not styles; they are yin/yang balances. Color is determined by your own coloring, not Image ID. Pattern and texture all depends on the head-to-toe outfit.